I might get kicked out for saying this but… have you tried doing instant mashed potatoes? There are some with decent ingredients (nothing funky) and they taste really good and are SO easy! I haven’t made from scratch mashed potatoes in forever. I haven’t made them at home, but anytime I’ve had them at a restaurant or elsewhere, I really don’t like them. Maybe I’d get used to them? 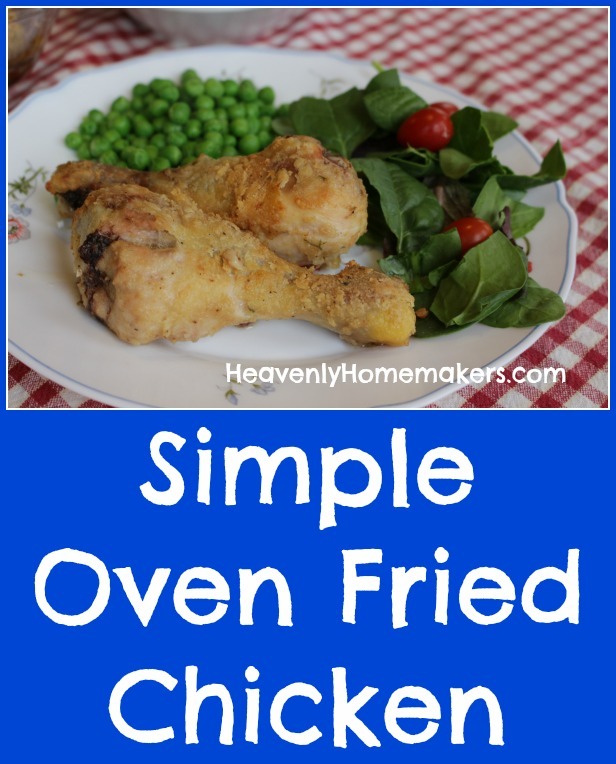 I can’t wait to try this oven fried chicken recipe. I have a Zaycon chicken order coming tomorrow so I will use some of the boneless skinless breasts and some chicken legs from the freezer. I am assuming that the recipe will work with any type chicken with adjusted cooking times. We will have this on Sunday with mashed potatoes. I love them and don’t mind making them! The potatoes can boil while the chicken bakes! I’ll have to use a cookie sheet instead of a 13×9 pan to cook the chicken so it all fits on one pan. Yes, any kind of chicken will work! I love fried chicken. I actually use club soda and coat (shake) chicken twice it comes out more crispy and since club soda works well in biscuits, pancakes, and for cleaning mirrors, glass , some laundry stains, etc (you don’t have to use much)it really doesn’t bust the budge (I buy wal-mart brand for under 1.00 and it lasts quite a while). Also if making mashed potatoes isn’t an option time wise, throw in smaller whole potatoes in oven while baking chicken (or pull out some frozen potatoes made ahead of time), incredibly fast…. then family members can load em how they like or mash em up themselves…it’s fairly easy to have a mix(homemade) made up for a quick gravy. Thank you so much for all the wonderful ideas you give on this site. 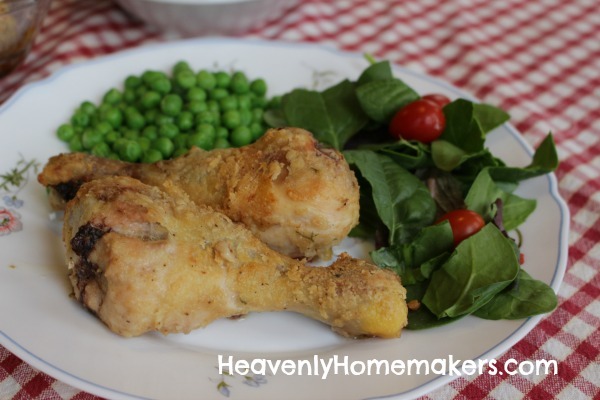 I had a family pack of chicken legs in my fridge yesterday wondering how to transform them into dinner, and – voila! Here comes your simple, crowd-pleasing recipe…my kids were wondering if I could just make a whole pan of the crispy drippings next time, too. :) Thanks for the great dinner suggestion! I second the “throw some whole baking and sweet potatoes in the oven at the same time” idea – I hate just turning it on for one item anyway! I do this, but I use panko instead of flour, and add some grated Parmesan cheese – so crunchy and good! I’ll have to try the flour – any thoughts on if almond flour would work? I’ve never tried breading anything with almond flour. I would imagine it should work though! Made this for supper tonight after a busy day. Super easy to put together…I baked a pan of russet and sweet potatoes along with it and cooked some frozen green beans from our garden last summer. Thanks for the quick and easy recipes! 8-10 bone in ….. legs? Hey Laura! I must say, your recipes always amaze me. They’re all so delicious! I can’t wait to try this one, I bet my husband will love it. Thank you!